Being the curious type, I often wondered what kind of mileage I can get with my old Honda Wave S. With petrol prices sky rocketing (it has gone up 6 times so far this year), so I really wanted to know. I set out to do a little experiment to calculate the fuel consumption of my bike. I am sure there will be more scientific and much more accurate methods to calculate a bike's fuel efficiency. I describe below the method I went with. Step one. Log odometer reading with a full tank. I filled the tank up to the brim. According to my bike's specification, my fuel tank capacity is 3.71 liters. I managed to pump around MRF 55/- worth. To log in my reading I took a picture of my odometer. It read 38,638.2 Kilometers. I rode the bike as I normally would, checking the odometer every now and then, and keeping an eye on my fuel gauge. On the 9th day, low fuel indicator started blinking. I wanted this test to be as accurate as possible, so I had to ride until the I completely ran out of petrol, but what if my bike runs out of petrol in the middle of main street? I rode out and bought a half liter PET bottle of petrol and kept it in my U-Box for emergency refilling. Step three. Log odometer reading with empty tank. On the 10th day, while coming back home from IGMH, my bike choked, stalled and died. I took a picture of the odometer again. It read 38,776.0 Kilometers. Lucky I had some emergency fuel supply, eh? Previous odometer reading = 38,638.2 Kilometers. Current odometer reading = 38,776.0 Kilometers. Distance traveled since last fill = 137.4 Kilometers. Fuel consumption usage = 37.14 Kilometers per Liter. 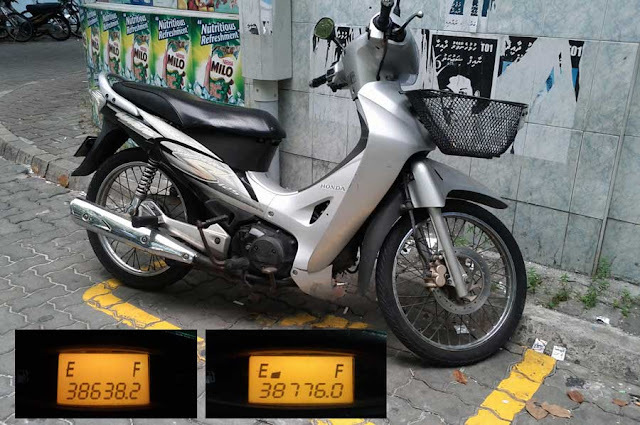 Fuel direct expense = MRF 0.44 per Kilometer. Fuel fill expense (full tank) = MRF 60.06. My milage turns out to be 37.14 Kilometers per Liter, thats about 2.7 liters per 100 Kilometers. My fuel consumption is 37.14Km/L while Honda claims 56 km/L for 125 cc fuel injection type. A difference of more than 60 percent. There are a few things to be taken in to consideration here. First, I could not find the official mileage for Honda Wave S. The one I'm comparing to is Honda Wave S fuel injection type engine. Second, for marketing reasons, Honda may have given the highway mileage. Fuel efficiency in urban environments tends to be much lower. Anyway, my bike's performance seems to be really low. I need to service my bike more often and be more regular about it. Also, I think I need to read some fuel economy tips on this automobile sites and club forums! Good Method, I'm gonna test this on GN now! Hey Nasheedh, very interesting article. i would have done this test if i had the bike heheheh. and you really should service it regularly, otherwise you would have to spend more money later. im saying this with experience. Your bike is newer than mine and also, your's is fuel injection type. Its supposed to a new and better technology to give better mileage! Are your sure your calculations are correct? Anyone got the mileage for a similar class Yamaha motorcycle? My bike results. Honda wave 125s. 9 years old. Full tank gave me 130 kilometers. We can also consider factors such as terrain that we run on, traffic and weight of the rider.